Now through January, visitors are invited to "Step back in time" and experience the amazing discovery of King Tutankhamun's tomb at the Oregon Museum of Science and Industry (OMSI). 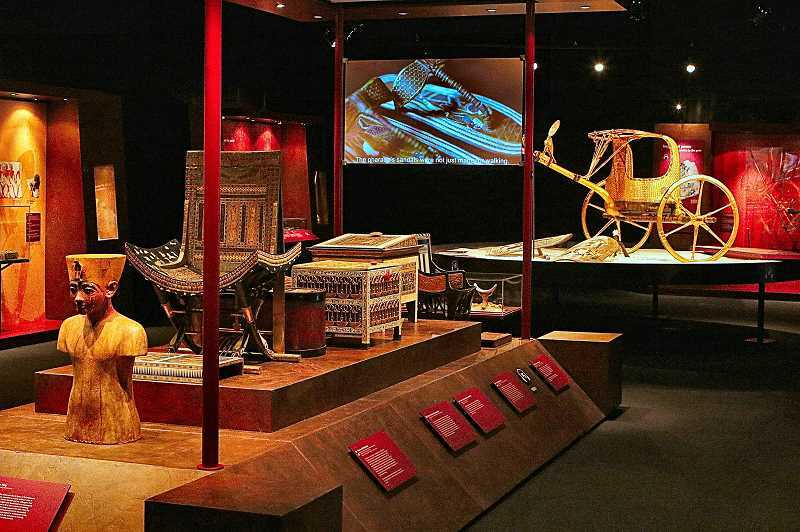 Entitled "The Discovery of King Tut", this newly-opened traveling exhibit is filled with some 1,000 objects – reproductions of the burial treasure of teen-aged Pharaoh Tutankhamun, who died more than 3,000 years ago. Don't let the word "reproductions" dampen your enthusiasm for seeing this exhibit, which covers a large portion of OMSI's main exhibition area. "These are exquisite reproductions that possess the beauty and detail of the originals, which are held in the Egyptian Museum of Cairo – allowing our guests to enjoy treasures without any harm to the fragile originals," remarked OMSI President Nancy Stueber about the collection. After a brief video introduction to the exhibition, guests begin to explore the replica artifacts, with the aid of explanatory graphics, video productions, and a personal "audio guide" keyed to each display. "What's unique about this exhibition is that when you come in, you see exactly how the chambers looked when they were discovered by Howard Carter in 1922; that helps you understand the process involved in unraveling and uncovering this find," explained OSMI Featured Hall Assistant Manager and Educator Jennifer Powers, while leading a preview tour. Then, standing before an actual-size replica of the outer "shrine" in which King Tut was found buried, Powers pointed out that it contains two additional inner shrines nested inside. "Inside that third shrine was his sarcophagus, inside were more coffins – so, King Tut had a lot of layers around him when he was buried, all beautifully crafted in wood and gilded in gold," Powers told THE BEE. To vividly relive what some call the most significant archaeological find of the 20th Century, be sure to see "The Discovery of King Tut", on display now through January 27. Or, just go visit OMSI, located at 1945 S.E. Water Avenue, under the east end of the Marquam Bridge on the east bank of the Willamette River, and just north of the Ross Island Bridge.